People of my generation may not know much of him, so I'll fill you in. He is a web character created by Doug Walker so he can make fun of movies. The Nostalgia Critic lasted for 4 years and 5 seasons, and is what inspired me to be a movie critic of my own, and is one of my major comedic influences. I like his anniversary movies, but the last one was by far the best. To Boldly Flee is a fun parody that has a lot of good comedic moments, but also really took itself seriously with emotion and a very thought provoking moral and idea. However, it is the last piece the Nostalgia Critic will be in. I will not spoil anything, but it was a perfect ending to a perfect series. Yes, The Nostalgia Critic is officially over. It is unfortunate to hear this news, but it leads to a brand new possibility. 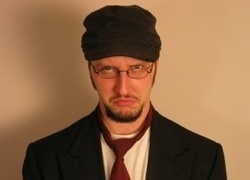 Now Doug Walker has more time for his other series, and he's working on a new one to replace The Nostalgia Critic. He has a casting call and a brand new set, so it's going to be amazing. And for the Nostalgia Critic, thanks for inspiring me in film and bringing me a sense of comedy. And, I always appreciated what you have done, thanks for being a good role model in criticism, you will be missed and I do hope I am to see you again sometime. As for the movie, To Boldly Flee. It was fantastic with a lot of the original reviewers returning, and many of the old villains That Guy With The Glasses fans loved to hate, like Terl from Battlefield Earth, General Zod from Superman, and Mechakara. It did not disappoint at the least bit, and want a full review? Maybe later. Thank you Nostalgia Critic, you are a hero, and as far as I'm concerned, you'll never die. The People of Imagination Planet. (A.K.A. Mark York).